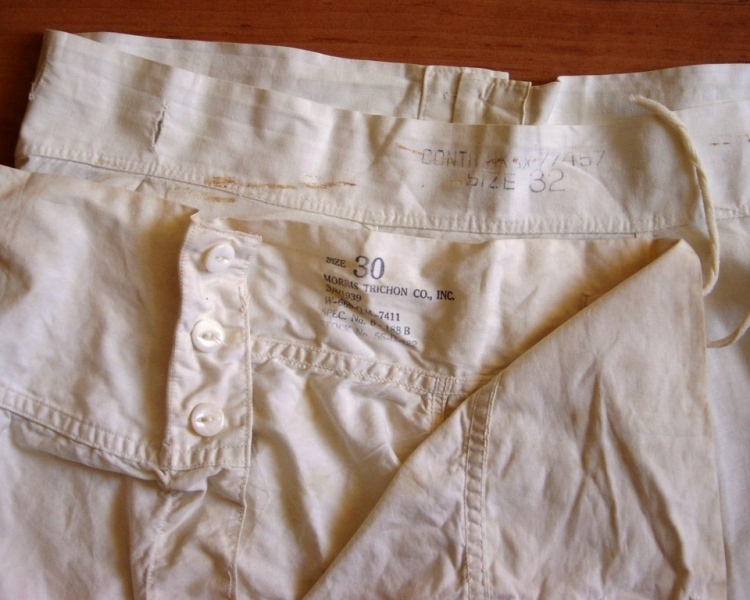 Since the Marine Corps is part of the United States Navy, it used the same underwear. 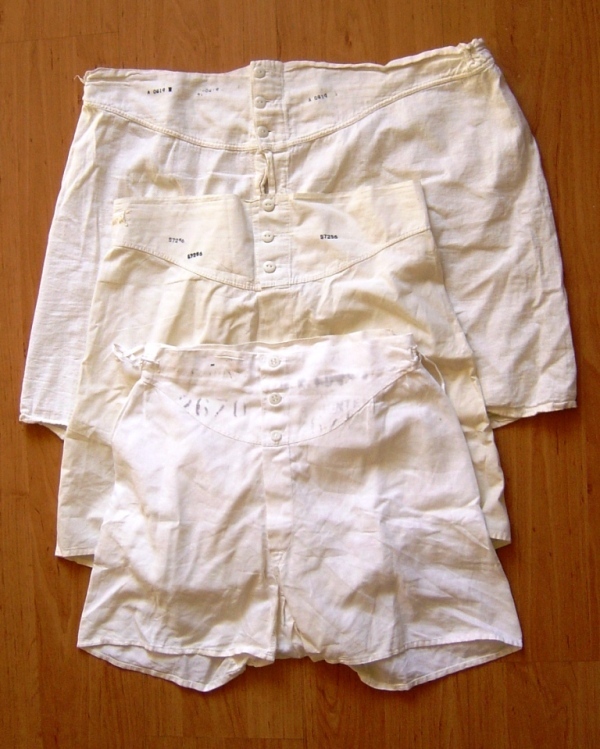 The Navy/Marine slang for underwear is “skivvies”, it comprises of a T-shirt (or simply a “Tee”) and a pair of shorts. The T-shirt is particular to the naval forces, the U.S. Army used a sleeveless undershirt. The standard color for underwear those days was white and the armed forces started the war with white underwear. The army quickly figured that it would be smarter to procure and issue a camouflaged version, so, soon these were made in an olive drab green. 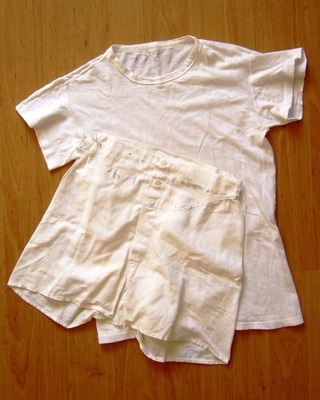 The Navy had no need for camouflaged underwear, so, through out the war the Navy issued white Tee’s and shorts. White skivvies, turned out, were not suited for land warfare. The Marine Corps found that out during their first combat actions at Guadalcanal. Soon the Marines were dyeing their shirts brown or green. It has been mentioned that the shirts sometimes were died with coffee, but that wouldn’t last long in the humid tropics, especially in the rain season. Late 1943, early 1944 the green issue Tee’s start to appear, but white shirts can still being seen as late as the Okinawa campaign. The color of the new shirts was not like the army’s OD. Nope. 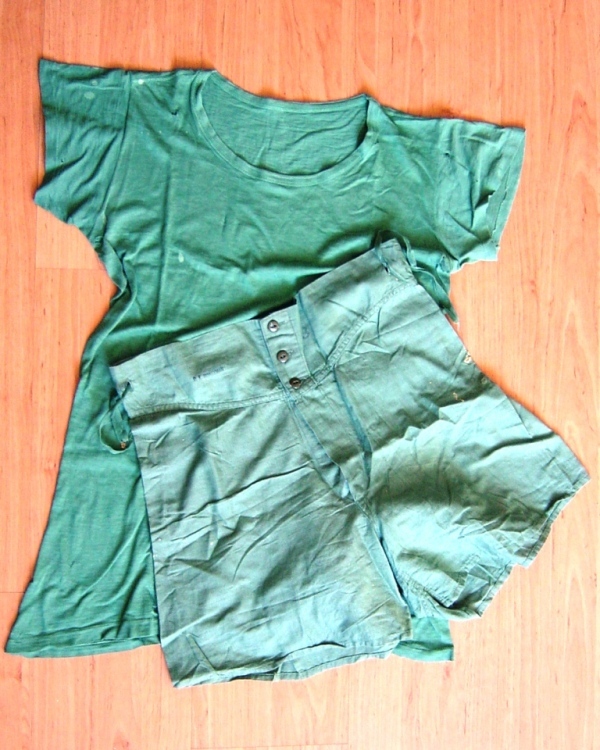 The Corps had to have their own kind of green, usually referred to as “Pea Green”. 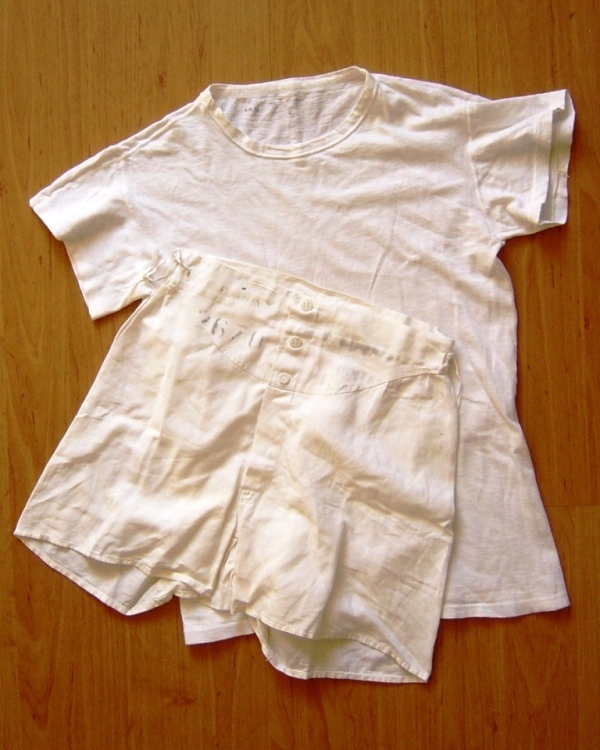 The T-shirts were made of a thin cotton fabric. The neck of the shirt was made from the same material as the body of the shirt. 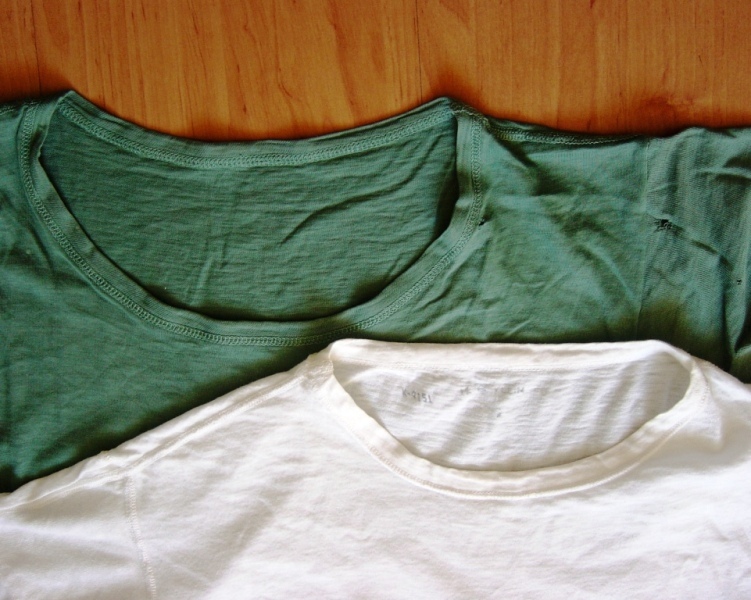 Note that the neck is a lot wider then the modern T-shirts of today, this type of wide neck is often referred to as a “crew neck”. Since the fabric is rather flimsy, these shirts worn through very easily. A lot of veterans also continued to wear these T-shirts when they came back from the war, hence why these shirts are so hard to find nowadays. T-shirt sizing ran from 1 thru 6, this is comparable with the even sizes of 34 thru 46 chest. 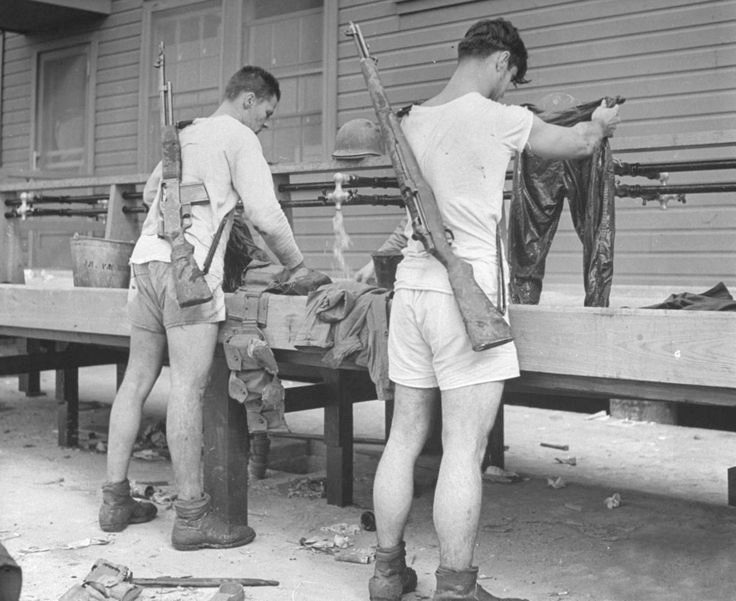 Marines wearing white skivvies are washing their gear and dungarees. Note that the BAR is of WWI vintage and the ammo belt is the WWI Assistant Gunners Belt. 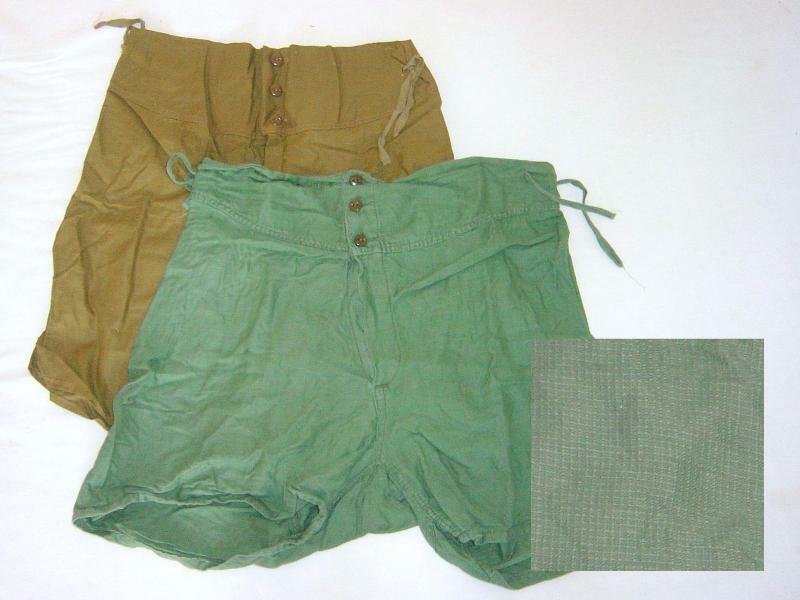 With the preparations for the invasion of the Japanese Home Islands the Marine Corps stocked a whole lot of green skivvies. When the war suddenly ended the Corps had enough underwear to last until the Korean war. After the Korean war the Marine Corps changed back to white, to go green again during the Viet Nam war.